The close relationship between food and wine is part of the wine tasting experience. Pairing great wine with great food elevates our senses and allows us to enjoy each flavor even more. It’s no surprise that some of the best cuisine in the world is being created right alongside some of the finest wine-growing regions in the world. And Arizona’s wine and food scene is no exception to that. We couldn’t properly celebrate Arizona wine country without offering some of the best fine food vendors as well. We’ve heard in years past that Festival goers look forward to the food almost as much as they look forward to the wine! Almost. When choosing the food purveyors for the Verde Valley Wine Festival, we kept a few criteria in mind. First and foremost, our food vendors must be based in Arizona. That means no chain restaurants or franchises – just local restaurant owners and markets. 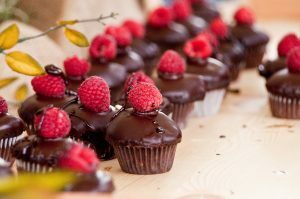 And secondly, we focused on foods that pair well with wines, whether that means decadent chocolates or hearty barbecue. Now that you know which food vendors will be there, now comes time to think about how you want to pair these with the wines. Wine experts suggest trying to pair the weight, or intensity, of the wine with your food. For example, rich, heavyweight foods like red meat casseroles complement full-bodied wines. Note that it doesn’t necessarily mean full-bodied red wine – in fact, a full-bodied white wine is usually a better match for meat than a light-styled red wine. Food that is covered in cream or butter sauces go well with wines that have been fermented or aged in new oak barrels. Oak imparts vanilla-scented, buttery, creamy flavors to the wine. Another thing to consider is the tannin level of the wine. The more textured the food, such as duck, lamb or steak, the more tannin you need in the wine. Tannin comes from the grape skins and stalks used in red wine-making. Different grape varieties vary in tannin content. For example, Cabernet Sauvignon, Malbec, and Tannat grapes all have very thick skins, resulting in deeply colored, high-tannin wines. The most important thing to remember as you try all the wines and food samples at the Festival is, there’s really no right and wrong when it comes to pairing. It’s always better to drink what you enjoy, and many wines go very well with lots of different types of food. For example, red wines can go great with seafood, if that’s what you prefer. Matching wine and food makes it all a more complete experience. Finding a wonderful wine that you can drink with your favorite dish keeps adding layers and complexity to your palate. Have you ordered your tickets to the Festival yet? They’re going fast, so don’t wait much longer.